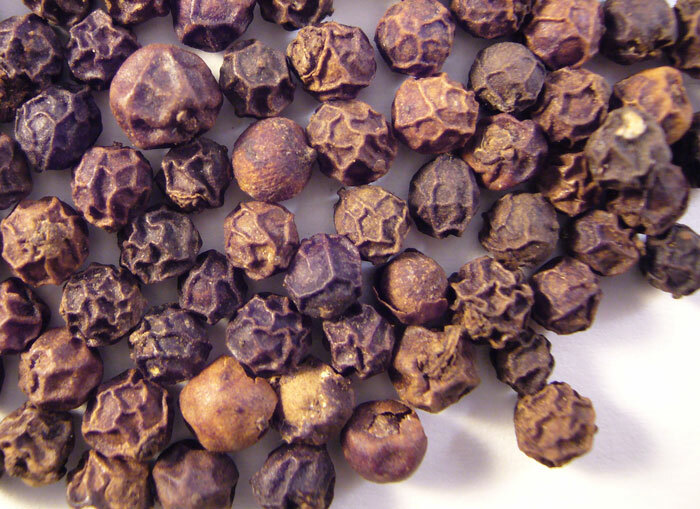 Black peppercorns are the most-used spice in the world. Until chilis were imported from the ‘the new world’, Europe, Africa, and Asia had only peppercorns and various analogs to add heat to food. Indian, Thai, and other cuisines are now inseparable from chilis, but this didn’t happen until the Spanish brought seeds back from the Americas around 1500. 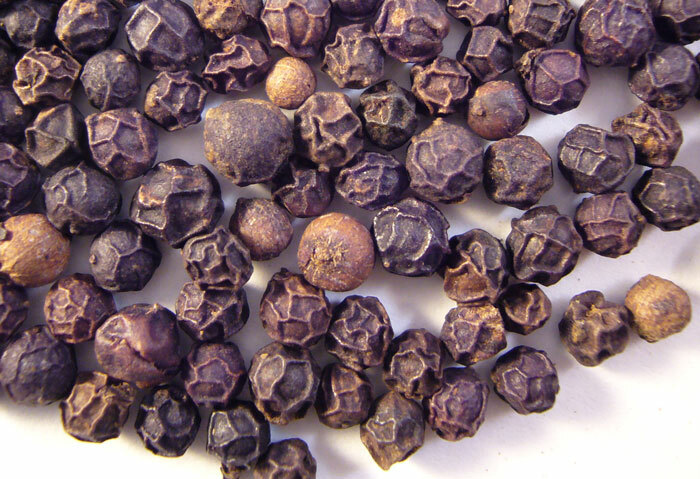 Black peppercorns are the fruit of a woody vine. The peppercorn “spikes” are picked when the fruit is full-grown, but still unripe. They’re dried in the sun and then the individual peppercorns are removed from the spike. 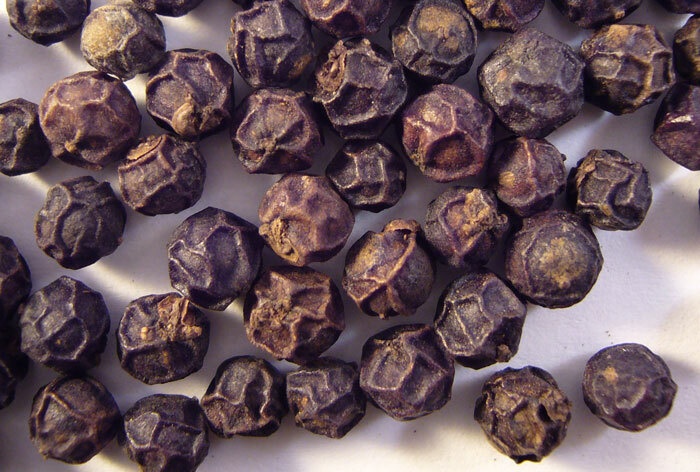 Many notable varieties of black peppercorns are named after the places they’re grown. 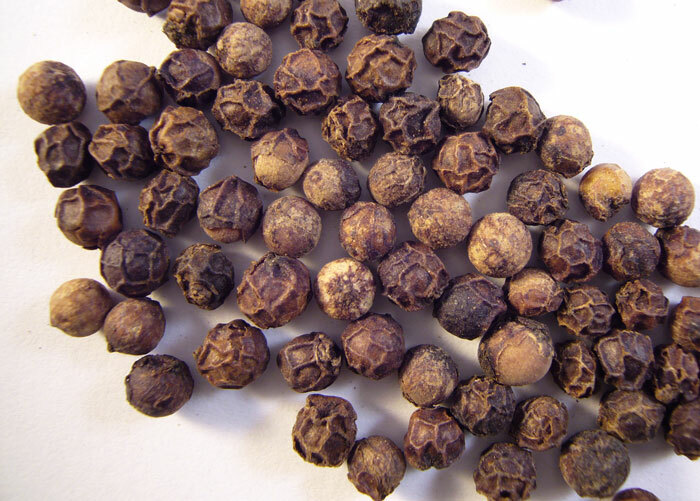 India Malabar – These are the best mass-market peppercorns grown in southern India, in a region that the British East India Company named Malabar. They are reputed to be very aromatic and pungent. Described as “Full-bodied, woody flavor, pungent aroma, plenty of heat.” A good, multi-purpose pepper for savory dishes and spice blends. 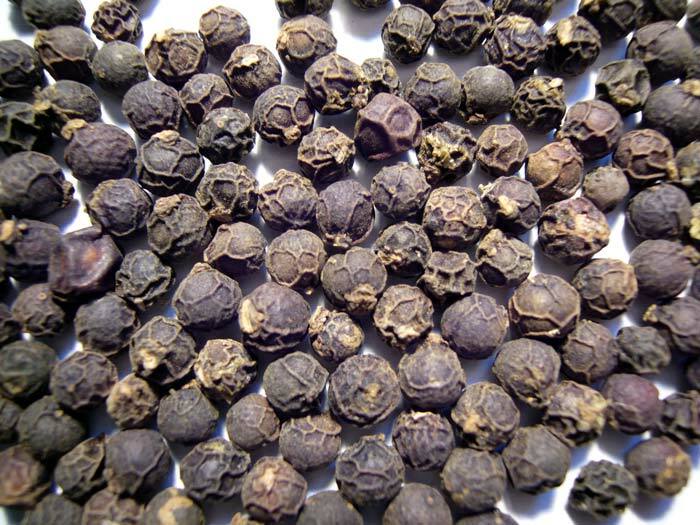 India Tellicherry – The largest, ripest 10% of Malabar peppercorns grown on Mount Tellicherry. A higher-grade pepper with a “complex, robust flavor.” Good where black pepper is a feature flavor. 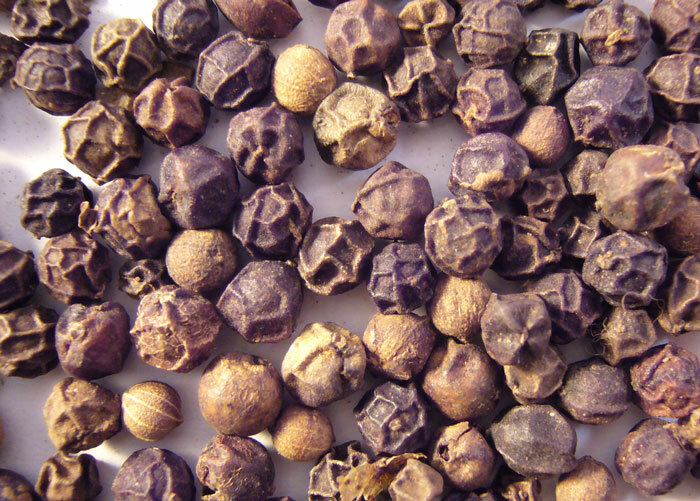 Malaysian Sarawak – - These peppercorns are produced in the Malaysian part of Borneo. This is a “mild and fruity” pepper that has smaller fruit than the Tellicherry peppercorns. I find them to have a weak, slightly dusty flavor. Less heat and lighter aroma, good as a background flavor. Indonesian Lampong – From the island of Sumatra in Indonesia. The taste is described as “pleasant and fruity” but still quite hot, and with a lighter aroma. Hotter than Sarawak. Mild sassafras aroma. Madagascar – Not as hot or ’spicy’ as Indian peppercorns, but significantly more pungent and flavorful. I find them to smell strongly of sassafras oil. The only place I’ve encountered peppercorns from Madagascar was through SA.VA. Import – Export. Ecuador – The Spice House sells peppercorns from Ecuador that are very hot, with a unique and interesting flavor profile. 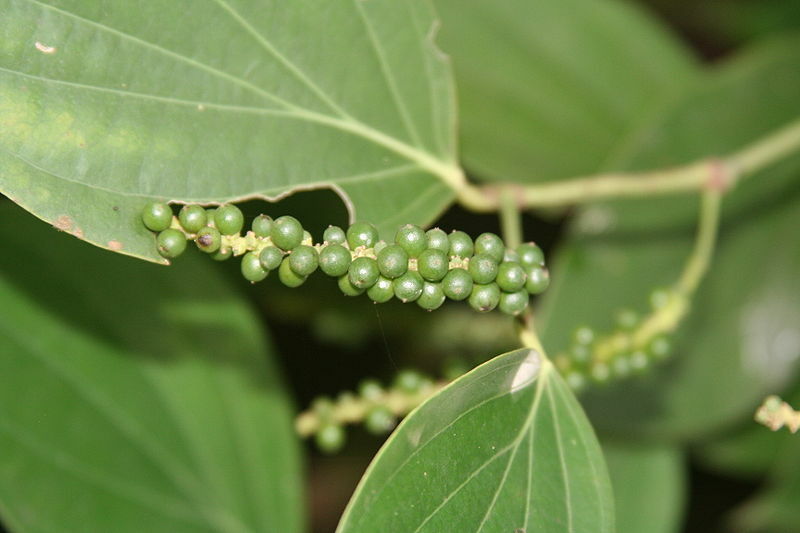 Vietnam – Vietnam is the largest grower of peppercorns. They are rather undistinguished. Kampot – French colonists brought peppercorn production to the Kampot region of Cambodia. Production was halted during the rule of the Khmer Rouge. Once all the rage among European chefs, Kampot peppercorns have only recently reappeared on the market. They are large size and very black and shiny. They have a fruity flavor and low heat. 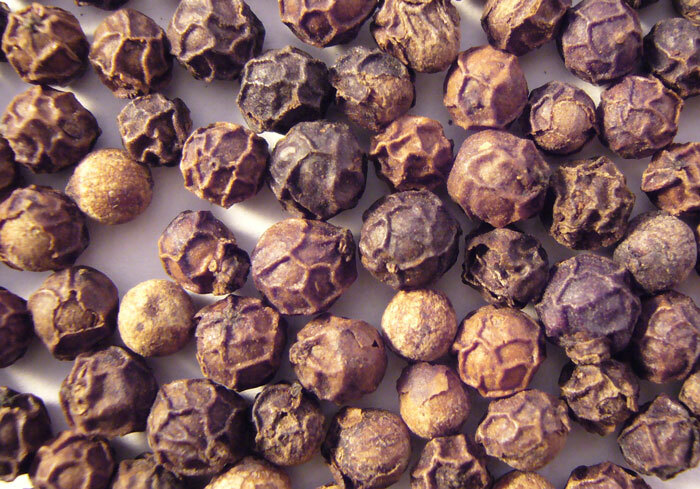 Pohnpei – The Micronesian island of Pohnpei has a very limited area to produce these highly-regarded peppercorns. Production is only recently recovering from a total collapse of the market several years ago. They are large, very black in color, and have a sweet taste. 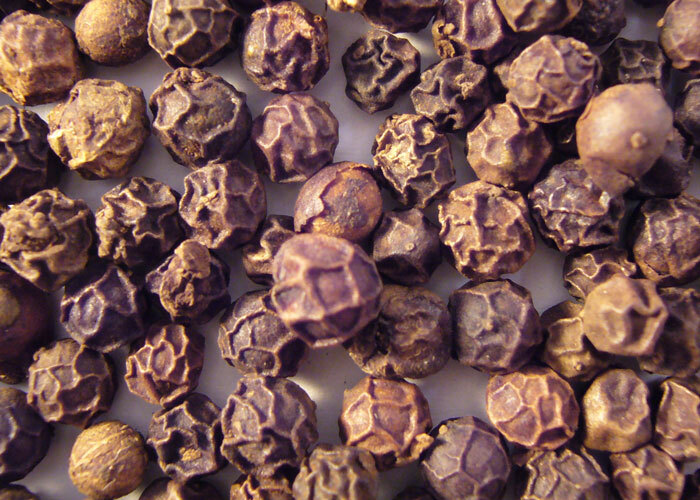 Brazil – Brazil is another large exporter of peppercorns. They tend to be mild. This is a different species of peppercorn, uncommon in the West but used in India and Southeast Asia. Hotter than black peppercorns (piper negrum). Ancient Romans referred to both this and piper nigrum as ‘piper’, and used them interchangeably. Can be found at Indian groceries as pipalli. 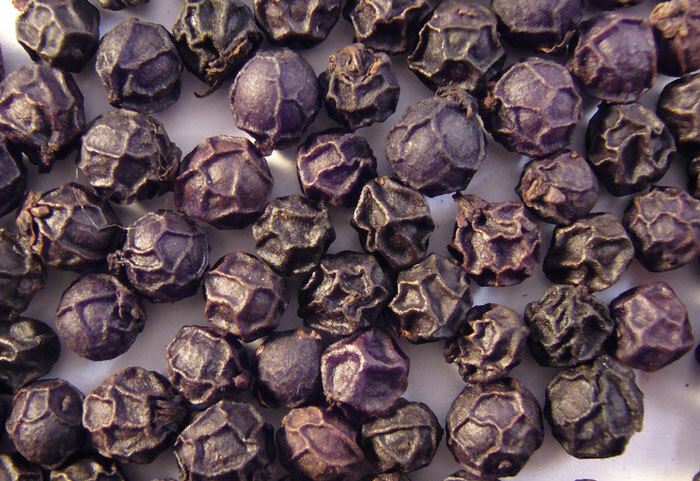 bulkpeppercorns.com – Tellicherry, Malabar, and Vietnamese. No response. Could you please advise me where we can buy daintree multicolour peppercorns in Cairns please? Many years ago, we spent a wonderful week in your islands and upon return to the airport for departure, we bought a container ( In a green and black cardboard, with the printing “export Grade Fiji Pepper from Wainadoi Gardens.” It was without a doubt the best black pepper we have ever had before or since. Is it still available and how could we get some more? I appreciate your reply. Thank you. I picked up two pepper plants (with roots) from Zanzibar and have set them in my garden in Tanga. what kind of growing environment do they thrive in? I thought I would contribute some new news from Pepper-Passion. Pohnpei pepper is no longer avaialable in the USA. The good news is that we have brought in some Penja white and black peppercorns from Cameroon. Very nice pepper, bold and a bit hot. I am writing having read the comment about pohnpei pepper is no longer avaialable. If you would like to have a pohnpei pepper, please visiting our website, we can sipping to US.